When I think about the rap and hip-hop that I love, artists like Tupac Shakur, Notorious B.I.G. and groups like Run-DMC, N.W.A and Public Enemy, something that is equally important to their respective legends as their actual music is the fashion that they showcased. Gang, street, or urban fashion, particularly among the black and hispanic youth of the United States in the 1980s and 1990s, evolved from being something exclusive to individual neighbourhoods to a world wide, multi million dollar industry, and this is down to the meteoric rise of rap, hip-hop and R&B music in the mainstream consciousness. From the creative and directorial mind of filmmaker Sacha Jenkins, Fresh Dressed is a documentary that chronicles the both the history of hip-hop and the history of urban fashion, displaying and detailing the symbiotic relationship that the two industries shared beginning as far back as the cotton plantations in the deep south, to the dangerous gangs on the streets of 1970s New York, to the over saturated, somewhat sterilised market of the early 2000s and beyond. 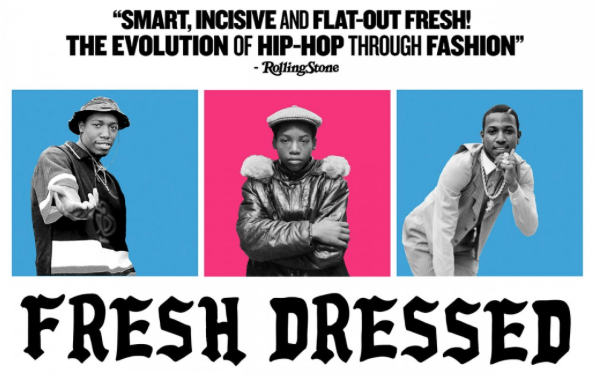 With contributions from several of the story’s most important and influential figures, the documentary provides a fast paced and endlessly fascinating account of what it meant for a young black teenager on the tough streets of Harlem to be able to dress in a way that became known as ‘fresh’. Meaning well put together, with immaculately cleaned and on trend garments, even the poorest teens would strive to own at least one outfit that they could flaunt on the block, and as some of these block kids began to gain national and then international recognition and fame for their musical abilities, so did their fashion sense. With a fantastic musical soundtrack filled with a number of the genre’s most important milestone tracks, the documentary brings each period of which it speaks to vivid life, providing archive footage of key events along with first hand accounts from both famous figures and ‘real’ people who lived through the changing and at times, incredibly dangerous environment. The central thread of the story begins in 1970s New York as the audience are treated to an enthralling insight in to the individual fashions of different gangs across New York city, and this insight is effortlessly snowballed in to a much wider discussion about the emergence of the rap genre and the subsequent explosion in black and other ethnic minority youths opting to wear the most lavish and expensive brands available from Ralph Lauren to Tommy Hilfiger to Gucci. 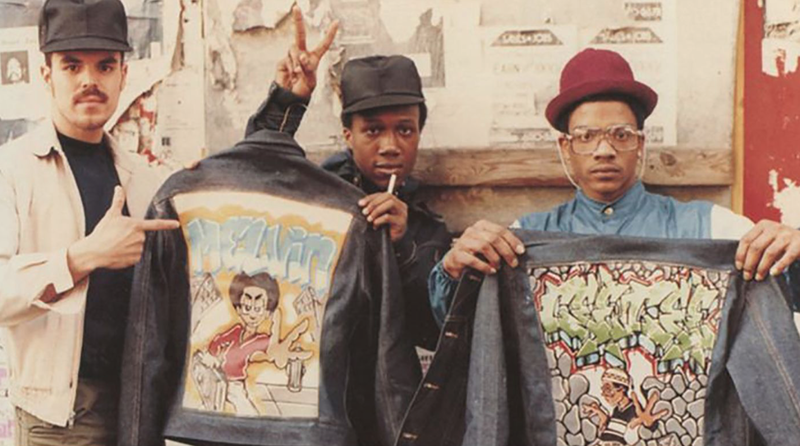 The emergence and highest popularity point of this period from the late 80s to late 90s is portrayed as a vibrant, exciting and revolutionary time for both the fashion industry and the rap genre, and this is put in stark contrast to how the documentary treats the over saturation of ‘urban clothing’ that began in the 2000s. The audience begin to see that what was once a raw and powerful movement, became something of a commercial money grab with eight of every ten rap artists bring out their own line of clothing. Something that began in the streets and defined more than a generation started to become an industry dominated by individuals only out for personal profit and exposure, and the documentary finished on a note of celebration for the fact that both hip-hop and it’s associated fashion had come so far, but also a somewhat cautious attitude as to where it is headed. Much of the great appeal and quality of Fresh Dressed is in the impressive cast on contributors that the film managed to amass. Jenkins showcases a well balanced mixture of both celebrities and civilians with strong roots in the evolution of hip-hop fashion, with interesting contributions from, but not limited to, musicians Nas, Pharrell Williams, Kanye West, Swizz Beats and Big Daddy Kane and fashion industry figures Karl Kani, Andre Leon Talley, Dapper Dan, and Daymond John. What makes the documentary so compelling is that the majority of accounts given by contributors are not just opinions on the matter, but details and stories of true life experiences as they were at the heart of the movement, either on the streets buying the clothes or in the studios designing them. Thinking about the topic in a general sense, you would be forgiven for doubting that the issue of clothing could be such an important one, but when the film is detailing events of actual assault and attempted murder over, for example, a coat, then the bigger picture of fashion as an inextricable part of gang culture and the subsequent hip-hop movement starts to come in to play, and I for one found it fascinating. Overall, Fresh Dressed feels exactly what it’s title suggests, fresh, interesting and a pleasure to watch. The history of urban fashion was never something that I felt I really wanted to know, but after watching the documentary it feels like an important lesson that has been well taught by a filmmaker who is clearly passionate about the subject, and has cared enough to put together an insightful and captivating film rich in history and important contributions. Highly recommended, for fans of hip-hop, fashion, or both.